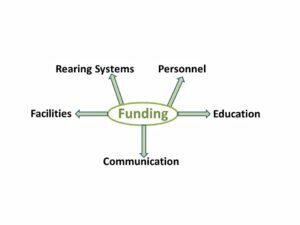 sources which drive the other components, 1) the rearing systems per se, 2) the facilities, 3) the personnel, 4) the education of the personnel, and 5) the communication about rearing advancements. These concepts are treated in detail in my upcoming publication: Infrastructure of Insect Rearing (being written for American Entomologist). While the details of the rearing infrastructure discussion are complex and detailed, I wanted to characterize them briefly here because I feel that rearing professionals (for whom this website is intended) can profit from visualizing the infrastructure as a whole. The rearing systems include the insect colonies themselves and the conditions under which these insects are reared, including their diets, environmental conditions, and containers. The standard operating procedures (SOPs) are an integral part of the rearing systems. The facilities are the rooms or buildings where insect rearing takes place, sometimes a shelf in a laboratory, sometimes a huge, factory-like building. The personnel are the people, often ranging from entry level workers (sometimes temporary workers) to the supervisors such as scientists or systems managers. Conventionally, and until very recently the education for the rearing workers has been strictly on-the-job training. More recently, workshops, courses, and webinars have been added to the more or less formal education, but this component of rearing system culture remains an area that needs much more formal attention. The communication of rearing information such as books and research publications has been neglected and under-supported. I (Allen Cohen) have been working on “raising the consciousness” of the rearing community and our stakeholders (customers) to help establish a system of standards and expectations for rearing communication. The essence of infrastructure is having some kind of firm assurances that if a study is done correctly (according to proper scientific or technology protocols, which I will discuss in several Posts in my blog), then the paper should have a “home” in journals or other forms of communication. Right now (and for the past 50 years, this “home” in respected journals has NOT been assured. I have treated this topic in my paper (Cohen, A. C. 2001. Formalizing insect rearing and artificial diet technology. American Entomologist. 47: 198-206), and I will be treating it in greater depth in a new paper that I am writing about Rearing Infrastructure for American Entomologist). 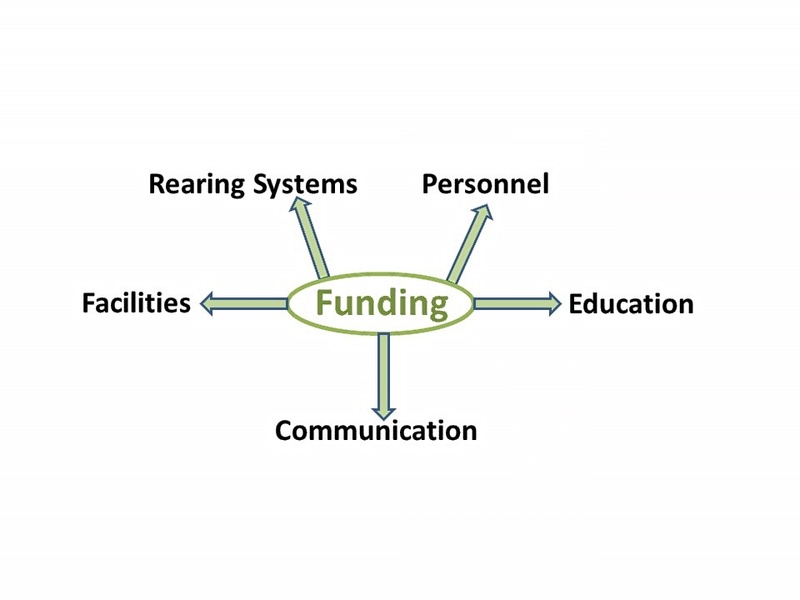 For now, I will mention the important point that the shape of rearing infrastructure is greatly influenced by the FUNDING, which drives all the other components. I am suggesting a rather radical idea: that direct funding for rearing research and education will greatly improve the quality and productivity of rearing. Because this is one of my central points behind this website and the rearing program at NCSU, I will address this topic MUCH MORE in future posts and pages on this site.